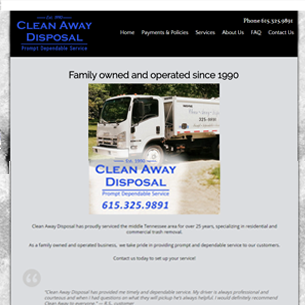 Clean Away Disposal, LLC needed a website. The family owned business has been serving middle Tennessee communities since 1990 and wanted to bring their professional company online. They had several goals for the website, provide information to new and existing customers about their services, list items that can and cannot be picked up, show office hours prominently on page, have ability to post weather updates if routes were affected, and have a login area to for online payments. The functional website gives their customers the needed information quickly and easily. An easy to read and navigate theme reflects the family owned, professional business. The site is maintained by the staff at Clean Away Disposal, so they are able to post weather updates immediately on the home page. Services provided and lists of items that are accepted for pickup are easily found. In addition, a page is focused on Frequently Ask Questions. Office hours, payment options are also easily accessible on the home page. The mobile friendly website allows their clients to easily get the answers they’re looking for or access their account easily. A logo was also designed for Clean Away Disposal that reflects their longevity as a locally owned and operated business. Their tagline was incorporated into the professional and crisp new design. The new website and logo combination has given this company a solidified image they use in all their publications, online, print and vehicles.